On the evening of Tuesday, November 26 around 8:00pm EST reports started to flood social media, police lines, and even media outlets of a flash of light in the sky, followed closely by the sound of an explosion. If you’re thinking meteor, then we’re on the same page. To read more about the explosion in the Quebec sky, check out this article that I helped to write for Sun News: Astronomers search for evidence of meteor after giant boom over Quebec. At the moment there are no reports of fragments being found on the ground. Speculation is that the meteor was about 1 meter in size – large enough to create a sonic boom, but not so big as to create the damage witnessed earlier this year in Russia. If you watched the video clip, the meteorite (or at least a piece of it) that Jesse was able to bring along from the York Observatory was a fragment of Sikhote-Alin. Always fun to represent YorkUniverse out there! A few videos from the meteor explosion over central Russia on Feb 15, 2013. 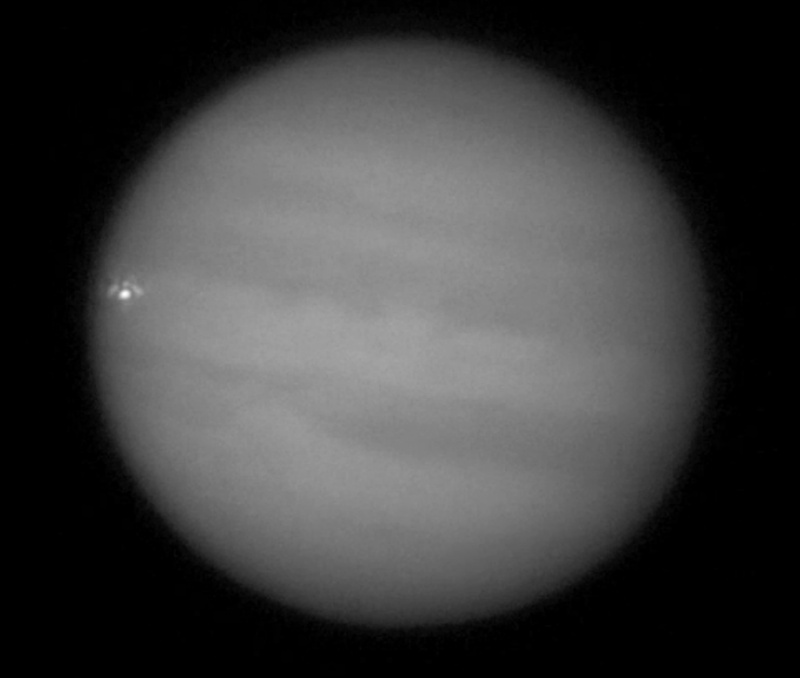 This story broke last night, following a report from an amateur astronomer who spotted what they thought looked like the flash from comet/meteor impact on Jupiter. The problem is though that by the time news of this observation got out, the impact site on Jupiter had rotated out of view so no one could immediately peer through their telescopes to look for the aftermath of the impact (which usually appears as dark spots in Jupiter’s clouds). And now it would be several hours until the impact site on Jupiter rotated back into view, so the mark left by the impact could possibly have disappeared – only large impacts leave marks that are visible for an extended period of time. But there is an important fact not to be overlooked: Jupiter is a popular object for amateur astronomers to watch, from all over the world. Some of them (and bona-fide Observatories as well) will record their observations (using photography or video) for any number of reasons. So there was immediately a possibility that someone captured this impact live – perhaps without even realizing it. An amateur astronomer by the name of George Hall, who lives in Dallas, caught the impact on video at about 6:30am on September 10, 2012 (time local to Dallas, TX, USA). It’s a good thing too: this impact could have been small enough that it wouldn’t leave any visible marks for more than a few moments after impact. If George wasn’t recording, it’s possible that this fireball would have remained a rumor. Astronomers will keep their eyes on Jupiter for the next couple nights to see if they can see any dark spots from last nights impact. This story demonstrates perfectly one of the things I love about astronomy: The word “amateur” doesn’t really mean all that much. If you have a telescope, binoculars, a pair of eyes, (or any of the above) and you record things that you see: you are an astronomer, through and through. You don’t have to work in an Observatory, or for NASA. Anyone can do it. Anyone can have a meaningful impact. For those of you wondering about Jupiter impacts: They do happen from time to time. Jupiter is a big object, and so it has a lot of gravity and does occasionally pull things in. 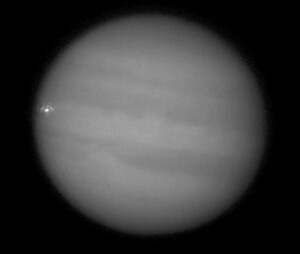 One of the most famous impacts on Jupiter was the comet SL-9 in 1994 (numerous giant fireballs that left visible marks on Jupiter for a couple days). Actually just a couple years ago, there was a fireball sighted similar to what happened last night. This certainly isn’t something you see every day though, so it is pretty special.